Kathy studied at A New Beginning School of Massage and in 1995 founded Excellence in Touch, Inc. in Austin, Texas where she uses a range of therapeutic massage and energy techniques to help improve circulation, detoxify the body, relieve tension, improve digestion, enhance muscle tone, and increase mental alertness while relieving pain and stiffness. A Reiki Master since 1998, she is certified to work in all three levels of IET (Integrated Energy Therapy) and is also licensed as a Massage Therapy Instructor and Reiki Master Teacher. 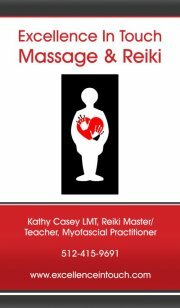 Using a combination of Reiki, IET and Massage Therapy, Kathy brings together a beautiful and powerful healing experience that makes profound differences in people’s lives. Additionally, Kathy is certified in Alexandria Professional Body Sugaring (natural hair removal) and is a member of Associated Bodywork & Massage Professionals. In her spare time, Kathy enjoys weight lifting, yoga and hiking.